Many young people who have been to a “Medieval Times” show certainly can remember the excitement of seeing many knights in shining armor joust as they put on their well-known epic battles. Of course such a production is fun, but what really happened during the Middle Ages? There are many fallacies that have arisen about the people and times and in this book you’re going to have a great time reading the answers to seventeen amazing questions. Of course the answers to a few of these questions will raise a few eyebrows. Take the question “Is it true that kids in the Middle Ages married when they were only twelve?” The answer to that one is yes. There were many reasons for such youthful marriages and amazingly “sometimes noble children became engaged when they were just infants or toddlers.” In this book you’ll learn many historical facts about this unusual custom. There are answers to questions about jousting, King Arthur, how children were educated, Robin Hood, travel, castles, handshaking, dentists, life spans, moats, drawbridges, and many other interesting facets of Medieval life. Each question is answered by discussing many fascinating historical vignettes. 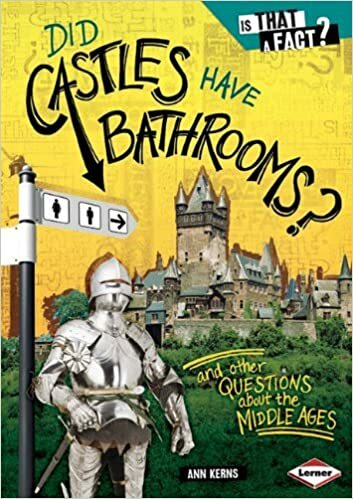 For example, when discussing those Medieval bathrooms, we learn that “peasant and middle-class homes had small outdoor toilets called privies.” You’ll just have to read the book to find out about the toilet arrangements of those castles! When you read about the bubonic plague that occurred during the middle ages you’ll find out how many people died, what caused this terrible illness, what the symptoms were, and what happened to society when the plague was over. The astounding answers to some of these “Medieval” questions will wow the young reader. Many times it’s difficult to separate fact from fantasy when “rumors” have come down through the ages, but this book assuredly sets them to rest with some very interesting factual answers. Take for example Robin Hood and his “band of merry men” who took up residence in Sherwood Forest. We soon learn that Robin Hood was a fictitious character from English folklore, but the forest, located in Nottinghamshire is the real deal. This book has a wonderfully busy layout with full color photographs, art reproductions, and double columned text. Sidebars such as “Who’s Who” and “Did You Know” were very informative and interesting to read. In the back of the book is an index, a glossary, a selected bibliography, and additional recommended book and website resources to explore. Quill says: If you’ve been wondering about what really went on during the Middle Ages, this is a very exciting book with answers to many questions that would stump even the die-hard Jeopardy fan!